Fiduciary (noun): a person to whom property or power is entrusted for the benefit of another. Recently, the “fiduciary rule” has been in the news. As the home page on our website says “We hold ourselves out as professionals and fiduciaries meaning that it is our legal and ethical duty to put your interests ahead of our own.” We hope that is clear to you. The 5th Circuit Court of Appeals ruled on March 15 that the Labor Department overstepped its authority by creating the so-called fiduciary rule, parts of which went into effect last year. In general, the rule requires advisors and brokers to put their clients’ interests before their own when advising on retirement accounts such as 401(k) plans and individual retirement accounts. Advisors and brokers do not have to put their clients’ interests first. In our opinion this can lead to higher fees and less appropriate investments. If you have questions, let us know. If you know someone who could benefit from our services and fiduciary standard, we’d like to know that too. 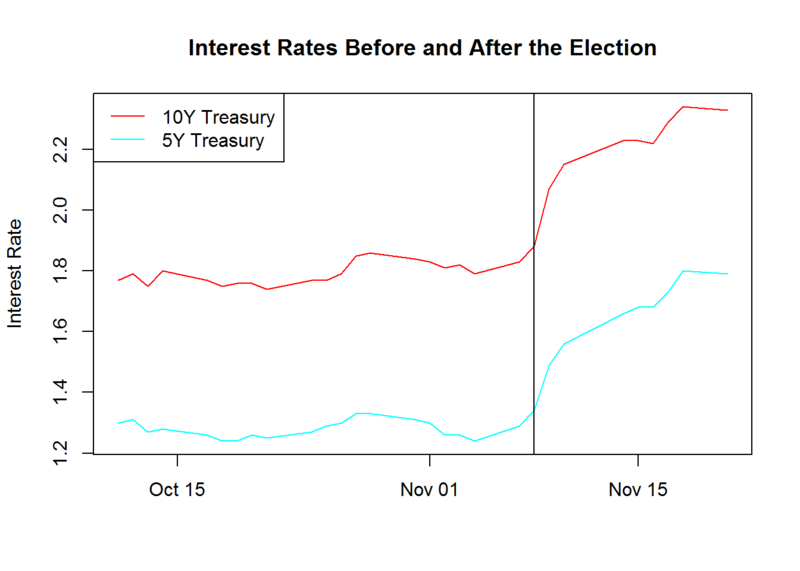 In this post we look at how markets have reacted to the election of Donald Trump and a Republican controlled House and Senate on November 8th. The reaction has been interesting and generally positive. It also highlights one of beliefs at Red Tortoise which is that markets predict the economy better than the economy predicts the markets. 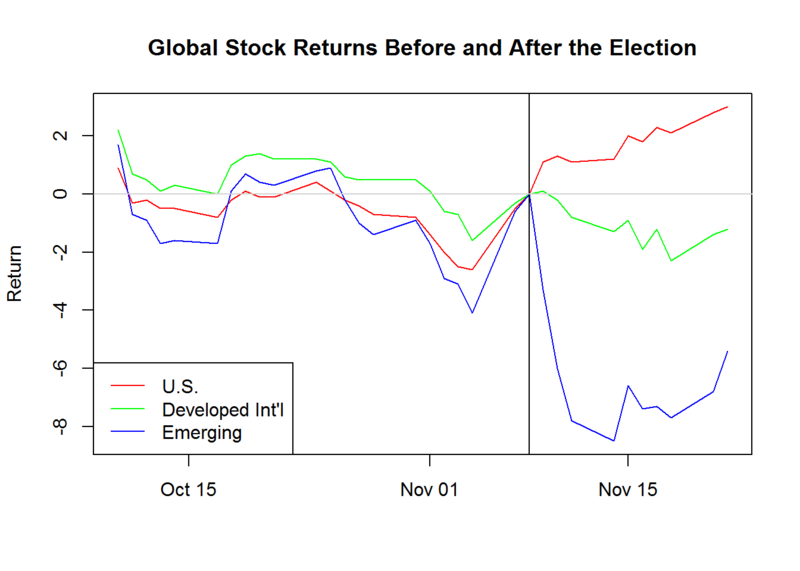 First, let’s look how stocks around the globe have performed before and after the election. For this we’ve picked three funds. • Stocks of developed international markets as represented by the iShares MSCI EAFE ETF (EFA) where EAFE is an acronym for Europe, Australia and Far East. 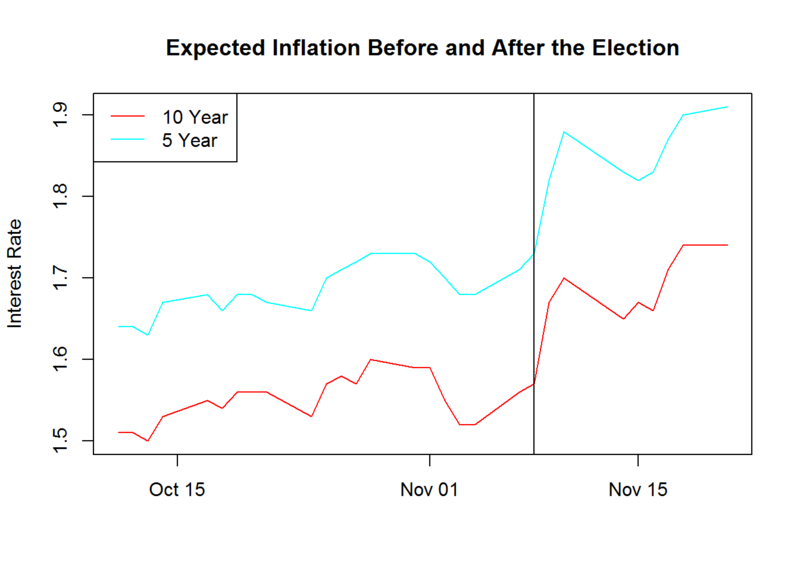 Election day (the vertical line) is the reference date and all the returns are indexed to zero so that the performance before and after can be visualized easily. None of the markets show a trend in the month leading up to the election. 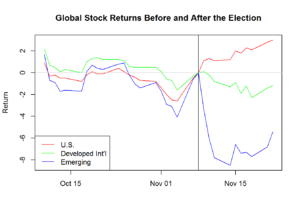 Since the election, the U.S. market has moved up with the developed and emerging markets have declined. From this it seems that the market might be expecting a pickup in the U.S. economic activity. However on the surface this isn’t helping other markets. If economic activity is going to pick up then we’d expect interest rates to rise and that is what we see in the following chart.If economic activity is going to pick up then we’d expect interest rates to rise and that is what we see in the following chart. A country’s currency rises when there is demand for that currency by people wanting to consume its products and services or invest there. 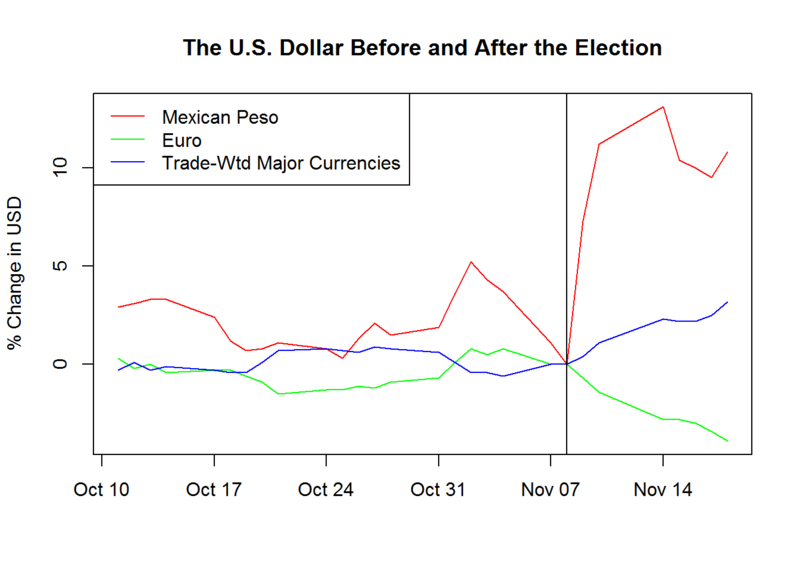 Since the election the U.S. dollar has appreciated strongly against the Mexican peso. It’s moved up relative to a trade-weighted basket of major currencies, but declined against the Euro. A stronger economy and rising interest rates might be associated with inflationary pressures. 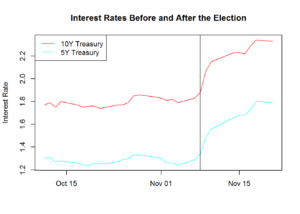 A market-based measure of the expected inflation rate can be inferred by taking the difference between the yield of a nominal Treasury bond and an inflation-linked bond of the same maturity. As the chart shows, inflation expectations have ticked up 0.1% to 0.2%. Disclaimer: Red Tortoise cannot guarantee the accuracy, or completeness of any of the information in this post. Red Tortoise shall not have any liability, contingent or otherwise for the accuracy or completeness of the information or for any decision made or action taken by you in reliance upon the information herein. Summary: Trump has promised to curb free-trade; he has unilateral power to do so; and the results could be disastrous for the economy. One may want to reduce equities now or be prepared to do should he follow through with his plan. ★ FIRST, I will announce my intention to renegotiate NAFTA or withdraw from the deal under Article 2205. ★ SECOND, I will announce our withdrawal from the Trans-Pacific Partnership. ★ THIRD, I will direct the Secretary of the Treasury to label China a currency manipulator. Trump is a mercantilist who rebukes economic theory and sees trade as a zero sum game where those who import more lose to those who export more. He looks to make the U.S. a winner giving little weight to the benefits of trade for U.S. consumers and geopolitical alliances. The President appears to have substantial unilateral power when it comes to restricting trade. The International Emergency Economic Powers Act (“IEEPA”) grants the President authority to take actions to restrain trade that would not be subject to court review in response to unusual and extraordinary threats to the economy of the United States. It’s conceivable Trump might try to use the powers under the IEEPA. Section 201 of the Trade Act of 1974 permits the President to grant temporary import relief by imposing duties or barriers on goods entering the United States. What would happen if Trump follows through on his promises? The most famous case study would be the Smoot-Hawley Tariff which passed the House in May of 1929, the Senate in March of 1930 and signed by Hoover in June of that year. It’s not fair to say that it caused the Great Depression, but it probably had an important role along with the stock market crash, overproduction and a tight monetary policy. Exports fell from $7 billion in 1929 to $2.5 billion in 1932. Farm exports were slashed to a third of their 1929 level by 1933 causing defaults and strains on the banks. I’m not forecasting the magnitude of the drag on the economy, but am saying there would be a drag and it could be large. Also, we would expect to pay more as import prices rise. The prospect of a trade war and the impact on the global economy suggests a reduction in equity exposure. On the other hand the S&P 500 stock index has risen with the news of Trump’s election. I respect markets deeply and the market’s behavior should give one pause. My plan is to be prepared to respond to words and actions suggesting the Trump administration is going to live up to his 100 day plan.